Napier: Virat Kohli complimented his team for putting in a balanced performance as India started off with a eight-wicket victory over New Zealand in the first One-day International at Napier on Wednesday. “It was one of our more balanced performances,” Kohli said in the post-match presentation. “I thought it was going to be a 300 par pitch but to restrict them to 150-odd was a superb effort. This fast bowling group together believe they can knock any side over,” he added. The skipper also heaped praised on Mohammad Shami and Shikhar Dhawan, saying their performance is a welcome augury. Paceman Shami took for three wickets for 19 runs to be the fastest among Indian bowlers to reach 100 ODI wickets while senior opener Dhawan anchored the chase with an unbeaten 75. Earlier, the Indian record was held by left-arm medium pacer Irfan Pathan who had picked his 100th wicket from 59 games, as Shami achieved it in 56. “This is the fittest I’ve seen Shami in his career and he has translated his Test form into one-day cricket. It was also a very important innings for Dhawan. We spoke about how he needed to finish games for to keep his confidence,” said Kohli. Shami meanwhile praised the team management and said his performance was a result of all the hard work he had put in rehab. “The injury was a big blow but I had good rehab facilities. I trained really hard and when I came into the team, everyone backed me and so I was able to push my limits. We had multiple plans for every batsman. “There is a slight change in conditions as compared to Australia, the weather is more cooler but the main thing is the dimensions of the ground. You have to keep that in mind while bowling,” added Shami. Dhawan’s 75 not out and his 91-run stand with skipper Virat Kohli helped India overwhelm the revised 156-run target with 14.1 overs to spare - the Duckworth-Lewis method employed after the setting sun stopped play for a while. 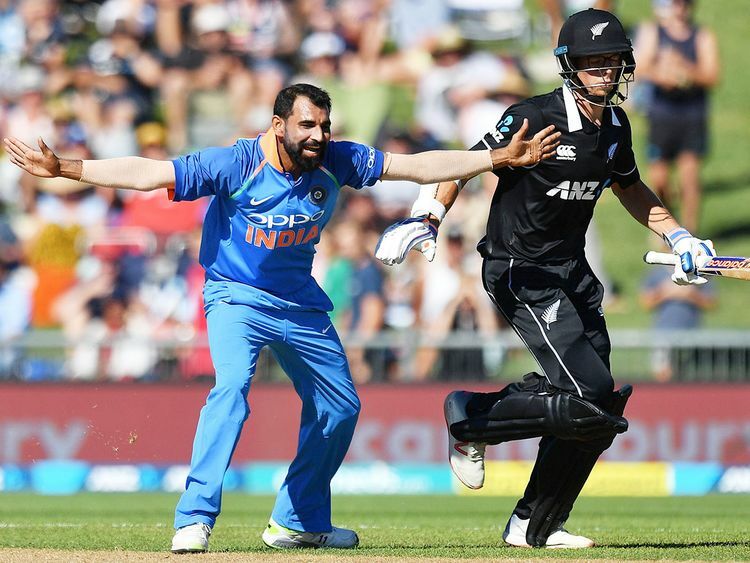 Shami and wristspinners Kuldeep Yadav and Yuzvendra Chahal shared nine wickets among them as New Zealand failed to post a competitive total with only Kane Williamson (64) offering some resistance with the bat. India were set a revised target of 156 from 49 overs when play resumed and the tourists made steady progress with Dhawan and Kohli cruising in the middle. The teams move to Mount Maunganui for the second match on Saturday.